The Roman conquest of Britain began in AD43, and the construction of Watling Street started soon afterwards linking Canterbury to St Albans. A small Roman town was built on the route, near present-day Faversham. Dr Wilkinson is the director of SWAT Archaeology - a company which carries out digs before major building work takes place on sites which may hold historical interest. 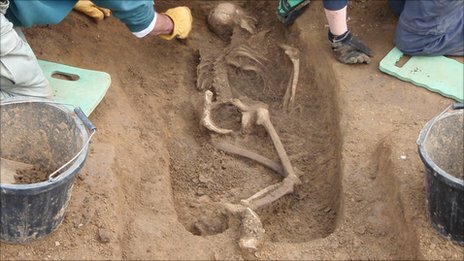 He was in charge of a training dig excavating Roman ditches when they made the shocking find. Dr Wilkinson said that she had been between 16 and 20 years old when she was killed, and her bones suggested that she had been in good health. He also believes the body had then been dumped in what looked like a hastily dug grave. "She was lying face down and her body was twisted with one arm underneath her body. One of her feet was even left outside the grave," he said. The burial site was just outside the Roman town, with cemeteries close by. Dr Wilkinson said the body was found with some fragments of iron age pottery which would date the grave to about AD50, and suggest that she was part of the indigenous population. Many people have a romantic view of the Roman invasion, Dr Wilkinson said. "Now, for the first time, we have an indication of how the Roman armies treated people, and that large numbers of the local populations were killed. "It shows how all invading armies act the same throughout history. One can only imagine what trauma this poor girl had to suffer before she was killed," he said. She will be re-buried at the site.